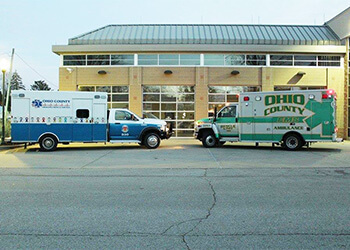 Ohio County EMS dedicates our efforts to saving lives, delivering quality emergency medical services and providing community education and safety. Our mission is carried out by emphasizing reliable service, quality training, cooperative alliances and community awareness through a committed and dedicated team. Whether it be for a first responder call, a rescue emergency or natural disaster, Ohio County EMS will be there to serve our community professionally and with courtesy and respect. 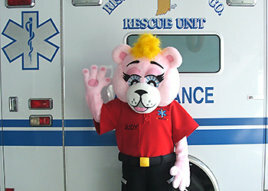 Judy is a member of the Ohio County EMS. Judy is used throughout the year for community public relations and with our children in our school system. Judy was funded through the vision of one of Ohio County’s senior residents who passed away, Vi Mollman. Thanks to Vi, we have Judy to share. A department roster will be added soon. Thank you for visiting this page.